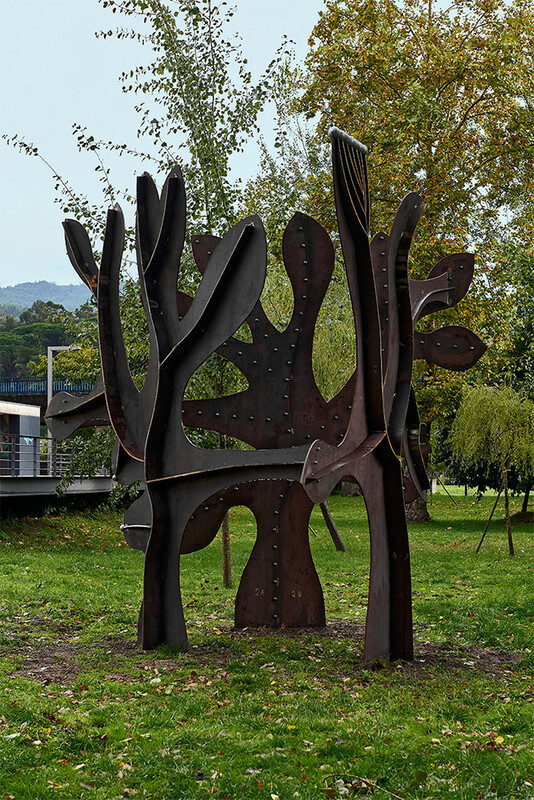 Made of weathering steel (which will rust through time), this sculpture by Portuguese sculptor José Aurélio for the Rabada park suggests a dance/composition of three vegetal elements. Pas de troi finds its lineage in Matisse’s cutouts (gouaches découpés), also based on foliage and gardens. Resting on only three points of support, the entire structure seems to flutter, due to its subtle, delicate design. The piece shows the “embrace” of three elements of vegetal inspiration, seemingly coming to life to stimulate our imagination and show us a metaphorical world. Adding to the sculpture’s playful aspect, those who visit the park will be able to join in its dance by enjoying its multiple viewpoints as they walk around or through it. Drawing inspiration from literary and poetic texts, José Aurélio’s recent production has been mostly focused on sculpture and medal design, which he has taken to a new level of expression. His public sculptures may be found in several Portuguese cities. Choosing materials such as wood, stone, bronze, wire, glass, concrete, and above all painted iron and steel, his aesthetically minimalist sculptures are often made up of geometric forms and volumes, spatially arranged according to a rigorous discipline aimed at relating to their locations as well as to the viewer, who is thus challenged to interact with them.